Windows RT, the version for ARM tablets of Microsoft's flagship OS, is available on a range of devices, including its own Surface RT.The 10.6 inch screen provides a fraction more room when compared to the apples iPad, but it's just as thin as Apple's tablet at 9.5 mm and isn't too heavy to carry, at 686g The Surface has a far more angular, business like yet sleek design. There is microSDXC slot, which lets you add up to 64GB more storage. 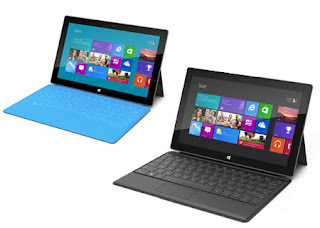 There is a Touch Cover, just 3mm-thick with flat keys .Surface RT feels like a premium product right out the box. Windows RT designed to run on ARM processors, and the Surface is fitted with a 1.3GHz nVidia Tegra 3 quad-core chip and 2GB of memory. Most interaction is via the touchy Modern Ul with its tiled design. One handy feature is the ability to configure multiple user accounts. Logging into the tablet with our Windows Live account instantly populated the tablet with our contacts, email and calendar.The Store lets you buy apps, although many everyday utilities, including Facebook, Twitter. 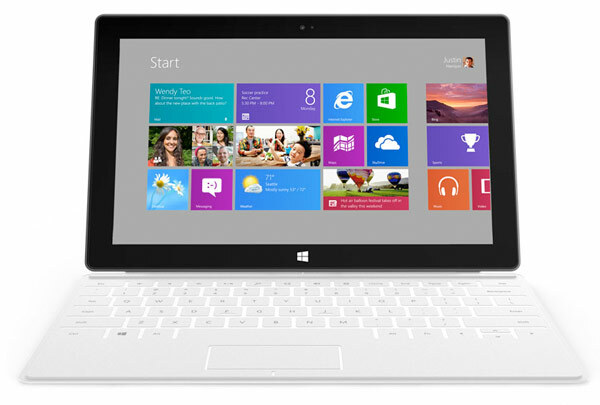 The Surface includes a preview of Office 2013. In short Surface a great portable productivity PC.